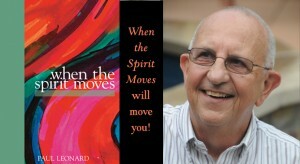 Paul Leonard is a man moved by a generous and loving spirit. His probing and sometimes humorous words come in many forms and this lyrical collection includes poems, prose pieces, family stories and even dog stories. While asking hard questions of himself and his God, Leonard writes love poems to his wife, his family and his Lord and takes the reader on a journey into a heart seeking justice for each and every man. Author of Where is Church and Music of 1000 Hammers, Inside Habitat for Humanity, Paul Leonard’s professional career has spanned the two disparate worlds of nonprofit ministry and big business. With degrees from Davidson College, University of Chicago’s Divinity School, and Emory University, he first served at Trinity Presbyterian Church and then founded a non-traditional church that focused on community action and service. He left the traditional ministry to work in city housing, and was later recruited by the John Crosland Company. He became the company’s president in 1984. After the company was acquired by Centex Real Estate Corporation, Leonard was appointed as its Executive Vice-President, responsible for the company’s southeast region. After retiring from Centex, Leonard was elected to the Board of Habitat for Humanity International; he served as Chairman of the Board from December, 2001 to December, 2003 and was employed as the Interim CEO of Habitat for Humanity from June, 2004 through October, 2005. Once again, Paul Leonard has shared his heart and opened his soul, and we who are often “Riding without lights / Crashing through each day” are better for it. His clarity of vision, generosity of spirit, grateful embrace of everyday things, and unflinching account of his own vulnerability are gifts to all who strive to build authentic, meaningful lives. " Paul Leonard, through his stories and poetry, helps us better understand ourselves – our doubts, disappointments, joys, perspectives, relationships and values – and shows us how faith, trust, love and commitment can lead us to live more meaningful lives. " My friend Paul has written a book that so richly reflects his life – filled with honesty, warmth, grace and faith. His poems have a psalm-like openness to both the joys and struggles of this season of life and reflect the wisdom gained from a life of servant leadership. This book challenges and encourages us to reflect on the good life as God intends. "